The Israel Antiquities Authority has announced the discovery of a quarry dating from the Second Temple period. Among the artifacts discovered is a door key (see picture to left). Here is what the report has to say. An Enormous Quarry Dating to the Second Temple Period was Exposed in the Ramat Shlomo Quarter of Jerusalem. Tools used by the quarrymen and a 2,000 year old key were also uncovered at the site. The huge stones that were quarried there were presumably used in the construction of the city’s magnificent public buildings. When looking at the size of the key one can't wonder about the size of the pocket that it must have fallen from. The Passing of Geza Vermes, 1924 - 2013. Jim Davila has learned that Geza Vermes died this morning. Here is a short bio I found on Wikipedia which seems to have already been updated. Vermes was born in Makó, Hungary, in 1924 to Jewish parents. All three were baptised as Roman Catholics when he was seven. His mother and journalist father died in the Holocaust. After the Second World War, he became a Roman Catholic priest, studied first in Budapest and then at the College St Albert and the Catholic University of Leuven in Belgium, where he read Oriental history and languages and in 1953 obtained a doctorate in theology with a dissertation on the historical framework of the Dead Sea Scrolls. He left the Catholic Church in 1957; and, reasserting his Jewish identity, came to Britain and took up a teaching post at the University of Newcastle upon Tyne. He married Pamela Hobson in 1958. 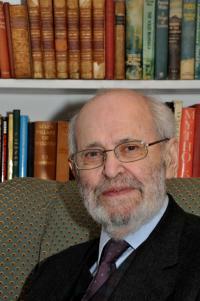 In 1965 he joined the Faculty of Oriental Studies at Oxford University, rising to become the first professor of Jewish Studies before his retirement in 1991. In 1970 he became a member of the Liberal Jewish Synagogue of London. Vermes passed away on 8 May 2013 after a recurrence of cancer. While Catholics and Protestants celebrated Easter back on March 31st, we tend to forget that there is a large segment of Christianity that doesn't celebrate holy days on the same day we do. If you are part of Orthodox Christianity then the Easter celebration was yesterday, May 5th. (See here for an explanation of why there are two separate celebrations). One of the highlights of Orthodox Easter is the Holy Fire service that takes place in the Church of the Holy Sepulcher in Jerusalem. The Holy Fire is, according to tradition, acquired by the patriarch while inside the sepulcher. When the fire ignites he then comes out of the tomb and passes it literally thousands of people who then pass it around to one another and then attempt to head to the airport in Tel-Aviv with the fire still burning. In 1998 Lori and I were living in Jerusalem and were literally caught in the midst of the Holy Fire procession. We were on our way to visit a shop and, aware that it was the day of the ceremony decided to take a different route to avid the crowds. What we didn't realize was that those who couldn't fit into the church were at various locations in the city watching the ceremony on CCTV. All at once doors began opening and the quiet street we were on was filled with Orthodox pilgrims from around the world clutching a fistful of candles that burned like a torch. Lori and pressed ourselves against the wall as we watched of a parade of people and fire pass by. In some ways it resembled a scene from a Frankenstein movie as the angry peasants hunted the monster. Below is a report on the ceremony as well as a short video of it. I suspect that it would be both an awe inspiring as well as frightening experience. Thousands of Orthodox Christian braved hours of waiting to witness the Holy Fire ceremony in Jerusalem’s Church of the Holy Sepulchre – an important annual rite for the Church’s eastern denominations. In what believers regard as a miracle, every year the day before Orthodox Easter, an unlit blue fire from a stone in the Church descends from the dome and ignites a candle held by the Patriarch of the Greek Orthodox Church in Jerusalem. Around 10,000 people squeezed into the Church of the Holy Sepulchre – regarded by many as the place where Jesus was laid to rest and resurrected – with about as many waiting outside. As the Patriarch received the fire, he passed it around, to other clergymen from other denominations (six of them share the church and consider it a holy site) and onto the gathered pilgrims. The appearance of the flame is symbolic of Jesus’ rise from the dead three days after his funeral. 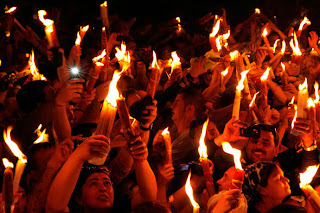 Pilgrims let the flames touch their hands – as the Holy Fire supposedly does not burn those who come in contact with it. Those outside watched the ceremony on giant broadcast screens. Candles lit by the Holy Fire were then taken to Nazareth, where Jesus was born, and to the home countries of the assembled clergymen. There are around 300 million Orthodox Christians in the world.